A friend/relative (Waves at Meghan) mentioned today that she had been given some black currant jelly. This reminded me of “the other currant”. Back home, in the garden of the home that Meghan is actually restoring, Aunt May had some black currant and red currant bushes, and they’d always be absolutely loaded with berries. 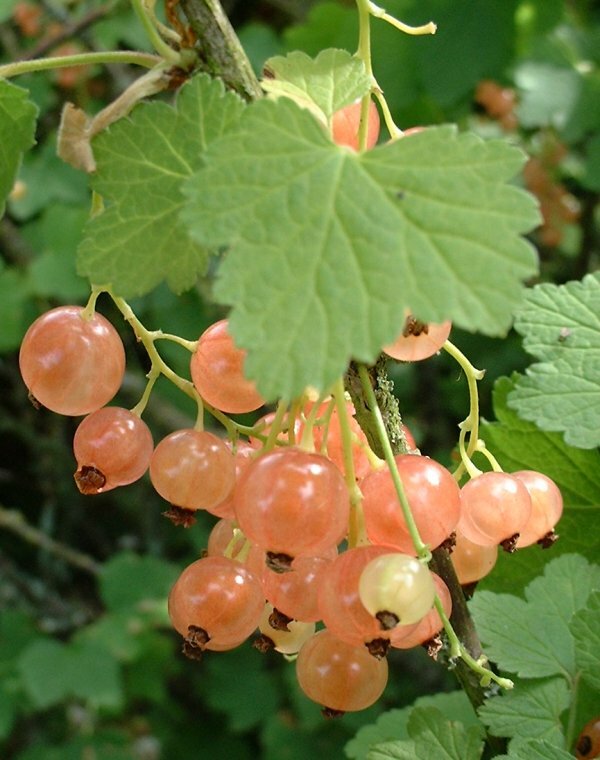 Lesser known though was out across the garden a little, near the path from running to Uncle Hay’s there was a white currant bush. While I know some people love black and red currants, I could never take to them, at least not raw, they do make good jelly; I have recipes here using red currant jelly for glazes and the like. But I’ve rarely heard of many talking about white currants, and noone seemed to actually pick them, well except me. They were sort of transparent, as you can see in the picture, full of seeds, and looked somewhat like a small gooseberry. But god were they delicious! The bush was smaller than the red and black currant bushes, and the berries themselves were smaller, but sooooo good. I wonder what the jam or jelly from these would be like? Meghan, start cooking some later in summer! Aunt May had the best apple tree. She always gave us some. The apple tree up near the road was technically Dad’s as it was given to him by his grandmother. But the apples were good nonetheless and shared with whomever. I actually sold enough one year when I was a kid to buy the winter boots I had been dying for!